The Economist is a weekly economics, politics, business, finance and technology magazine. It is available world-wide and has an enormous readership. Magazine promotions are commonly seen to use promo gifts within their marketing campaigns. 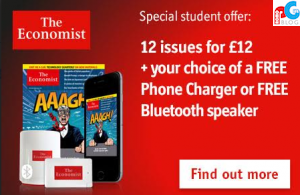 With a purchase of 12 issues for £12, students are offered the choice of a free phone charger or bluetooth speaker. Useful. Tech promo gifts are brilliant as they are guaranteed to be needed at some point. Offering products that encourage use is essential when offering a free gift. Relevant. Students are constantly on the search and in need for the latest tech. This is a great way to target them. Branded. The Economist have cleverly integrated their logo on the two products. This can help with gaining brand awareness and further recognition. Design. The colours align with overall brand themes and the products are cleanly designed. Offering a gift with purchase is a brilliant way to offer additional incentive and can help catalyst a stimulation of sales. When offering products such as these it can be assured that the campaign will be a successful one.